I cannot point out the exact moment when I started to listen to David Bowie. I must have been 15 or 16 years old and in the midst of a very angsty adolescence. Years flew by and I kept listening to the Think White Duke. I met people, incredible people with whom I shared a similar musical taste and of course, introduced me to some more incredible music. When I heard the news that Bowie wasn't going to tour anymore (2006?, maybe? ), I felt very disappointed because it would mean that *I* wasn't going to be able to see him play live, ever. The only comfort I had back in the time was that, despite Bowie not touring again, he was still going to release music. You can imagine my shock and upset when in a cloudy January morning, I turned on the tv to find the news. There, with images of the Blackstar music video, I was informed of Bowie's death. Two days earlier he had just turned 69 years old. It was hard to digest the news that your musical idol, the icon, the chamaleon, the one person that brought your closer to people physically away from you, had passed. That morning, I woke my sister up, who was staying with us and told her about the news. We went back to my bedroom, change the channel thinking it was a bad taste joke. In the other network we confirm it. News guy wept and told us, Bowie had really died. For several days during that week I felt really sad, as if someone close to my family had passed. 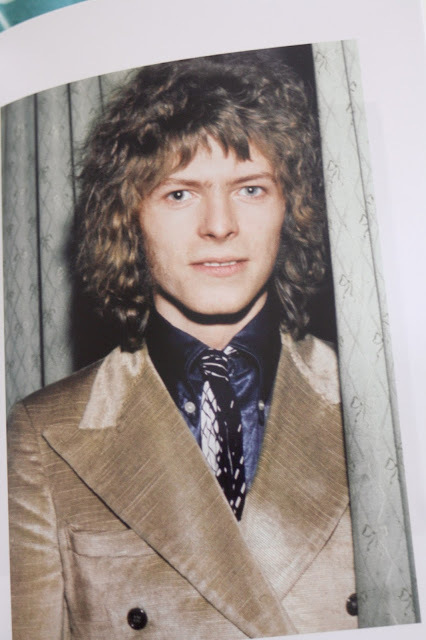 Online, you were able to find thousands of articles about Bowie, anecdotes (my favourite was when a fan run into him and Gary Oldman and Bowie signed the autograph as Oldman), never before seen photos. The only acceptable music was the one that Bowie had made. Fast forward several months later, and I am planning my first trip to London. On the list of the must-go places, is, of course, the David Bowie Mural Memorial, in Brixton. Painted in 2013 by artist Jimmy C. it became a shrine for mourning fans. It is a very lively rendition to the cover of the album Aladin Sane. Fast forward several more months later and I am in London. I take the DLR from Blackwall in Tower Hamlets to Canning Town, then the tube, Jubilee line 'til Green Park. I change stations there to the Victoria line south bound and I get off in the last station, Brixton. Once I left the station, I was clueless as to where to walk. I thought that in the streets I was going to find directions to the mural, but wasn't able to find any. I walked around a bit, first towards the right, then towards the left. I walked around Brixton, I was in Lambeth. I decided to take another walk around Brixton and I was getting hungry so I was looking for a place to grab a bite. So just when I was about to turn right, I saw it! 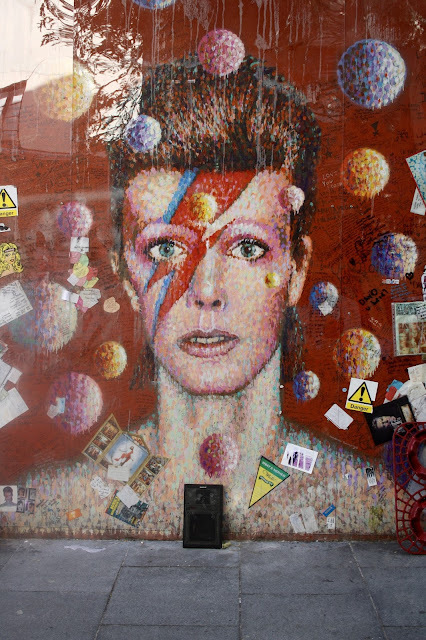 Against a dark red wall, and protected by a transparent mica, adorned with messages, drawings and photographs from fans, The David Bowie Mural was expecting me to see it! I was lucky enough to have it all for me, since it was around 2 pm on a thursday and there wasn't much people around. Despite the mural is very close to the road (and just across the street from the tube station, but of course I missed it before) the place was very quiet and I was able to enjoy it, to take it all in and feel free to be very emotional. I got to read some of the messages fans wrote after Bowie's death and that's when you really notice the impact that one man had on so many lives. That he was able to touch so many people, all over the world and in so many differents ways is very impressive and made me have even more respect for him. 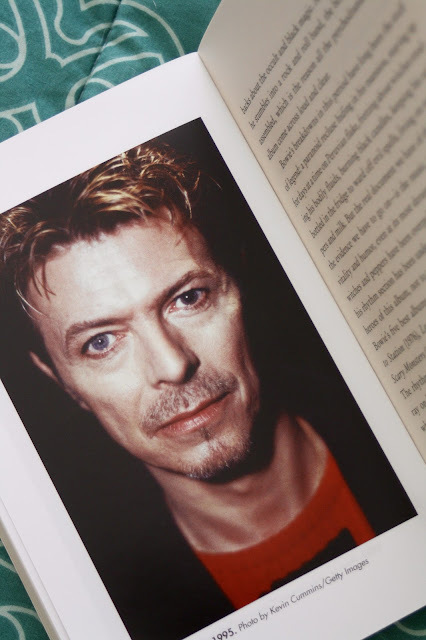 Bowie's artistic legacy moved through the phases of so many people's lives, accompanying them, changing them. He was the soundtrack of so many. A few days later I was browsing the Tate Modern gift shop when I found a book (that I end up buying). It's called "BOWIE: From A to Z. 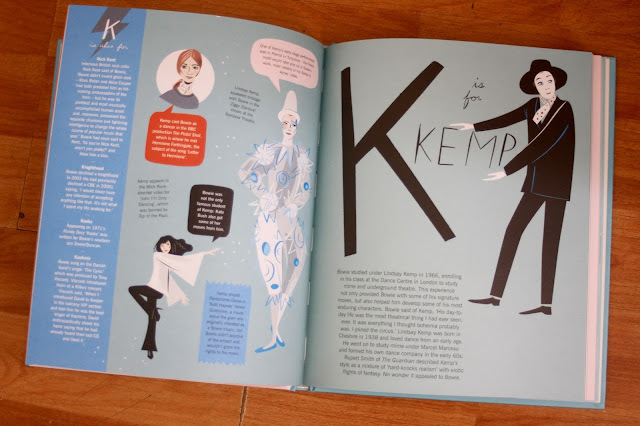 The life of an icon from Aladdin Sane to Ziggy Stardust", written by Steve Wide, it reviews each letter of the alphabet with something related to him, his life and work. 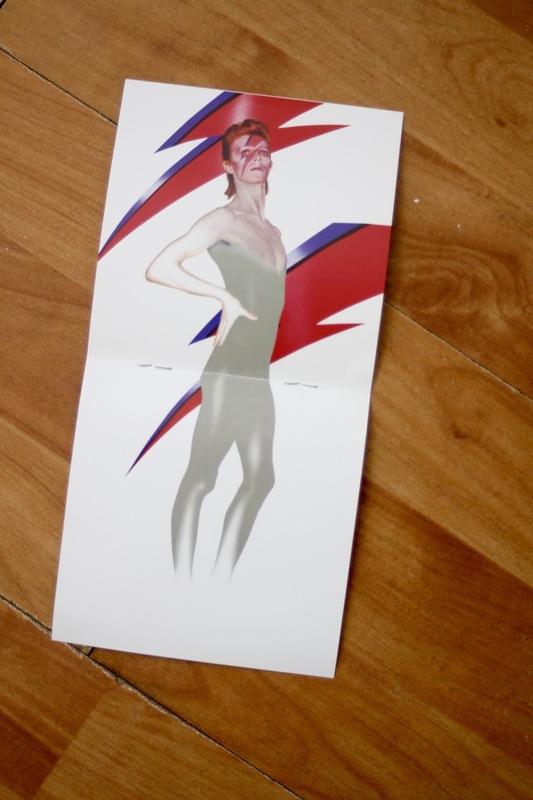 A is for Aladdin Sane, I is for Iman, J is for Jones, Y is for Young Americans. It provides history, (little) unknown facts, and the cutest ilustrations. Later that week I was walking around Camden and I walked past a bookstore that was closing and had an incredible sale of all available books (that weren't many). While I was able to find Richard Dawkins "The God Delusion" for less that a fiver, and a Paul McCartney biography for my sister for about the same amount, I found Rob Sheffield's book "On Bowie" for less than four pounds. 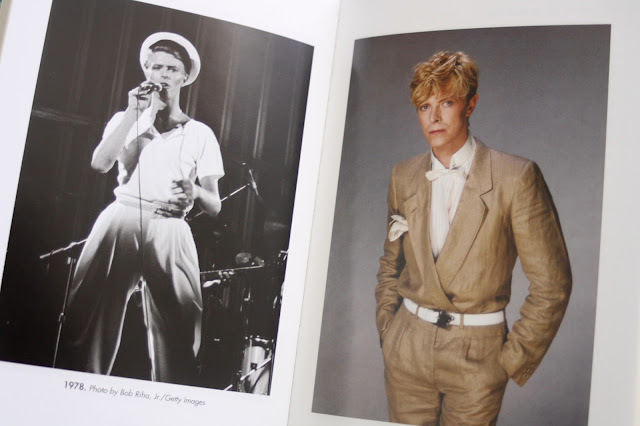 It's a 195 pages biography, divided in 21 chapters from The London Boy to Blackstar. 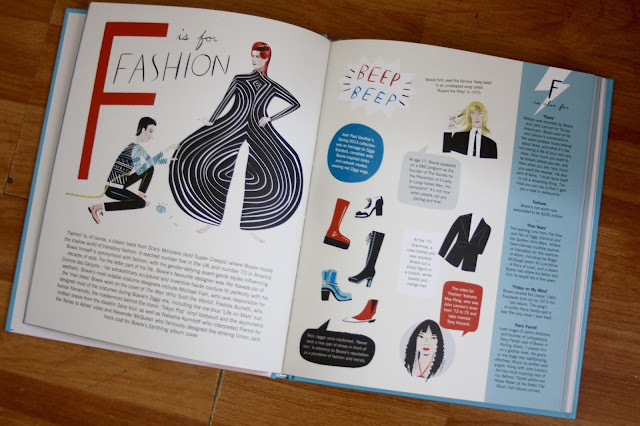 Each chapter is about six pages long which is enough considering the lenght of the book. Also, there are some seriously great photographs inside, which is a feast to the eye considering they are all about David Robert Jones. 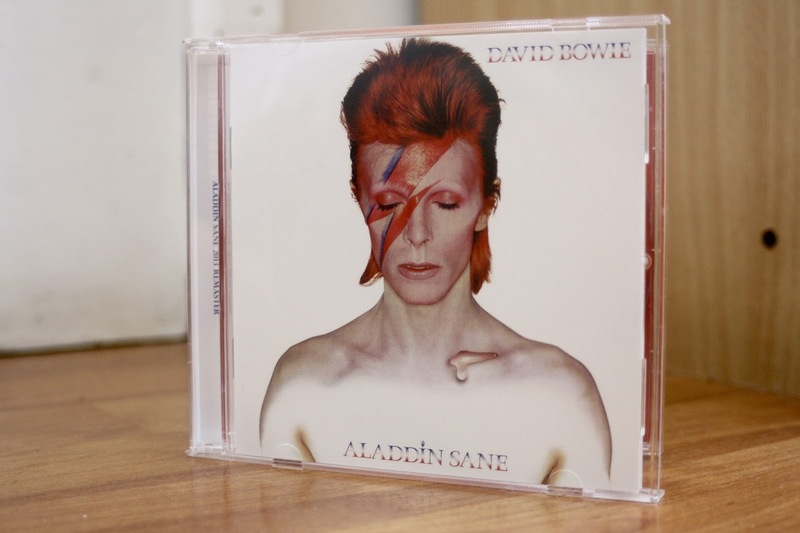 My final Bowie-related purchase was the 2013 remastered version of Aladdin Sane. I was in HVM looking for the Suede's albums I was missing from completing the discography and in a corner I saw there was a sale, two cd's for just £10. Some of the titles were Bowie so of course I jumped at the chance. 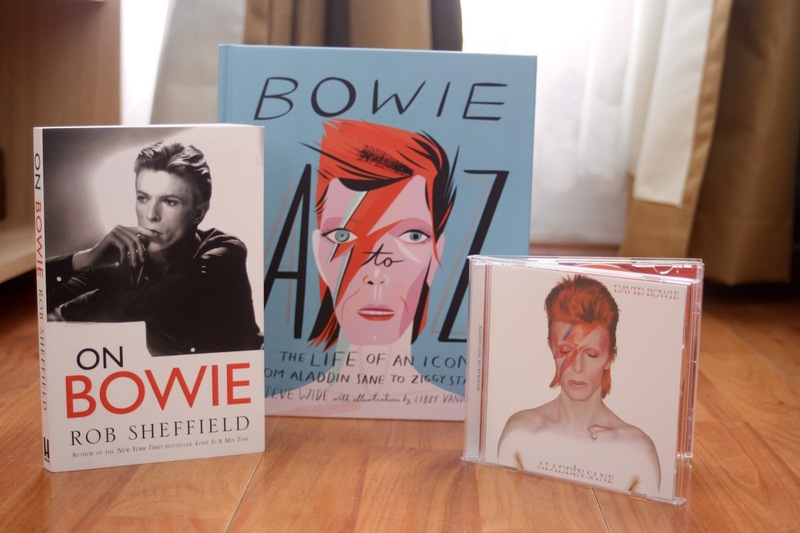 I got two, one for me and one for my sister, who is also a big Bowie fan. I think she liked it because she seemed amused when I handed it to her. That afternoon I also saw at a very reasonable price, the vinyl for "The Rise and Fall of Ziggy Stardust", but I thought twice before buying it because how was I supposed to fit a vinyl in a suitcase and not break it. Maybe for the next time when I don't have to fit it in a suitcase. I am very happy with my Bowie related purchases, but the one thing that made me happier was being able to see the mural. I payed my respects to the idol and may had shed a tear or two. No money in the world will make me feel that way ever again and I'm very excited that I could have achieved a goal. Tags: David Bowie, music, This isn't rock and roll this is genocide!